With feelings of pride and honour I am announcing the commencement of the Miss Tibet Pageant 2017. This year we have the most contestants ever in the Pageant’s 15-year history. In four of the editions over the years, the Pageant had to live with only one contestant, who then became the walkover winner. The Pageant was started in 2002. Chemi Kyizom, 20, from Delhi; Migmar Dolma, 22, from New York; Saldon, 19, from Vienna; Tenzin Khechoe, 22, from Bangalore; Tenzin Nordron, 20, from Chauntra; Tenzin Norzom, 22, from Manali; Tenzin Paldon, 21, from Kollegal; Tenzin Yangkyi, 25, from Byalakuppe; Tenzin Yeshi, 20, from Bylakuppe. 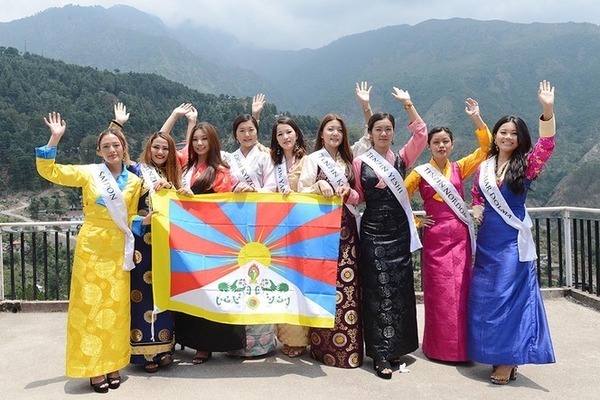 Many previous winners have gone further and participated in various international Pageants, with at times the Chinese government jumping in to block Miss Tibet’s participation. But the Pageant is not a political platform, and such unscrupulous acts by a powerful country are uncalled for. Every opportunity is not politics, and young women need many such platforms if we are to be practical about Women Empowerment. The first round of the competition — the Swimsuit Round — will take place on 2 June. Talk and Talent Rounds will take place on 3 June at Tipa, and the Grand Finale will be held on 4 June on theTipa Grounds. As in the past, the winner will receive one lakh (100,000.00) rupees, fifty thousand for the First Runner-up, and twenty five thousand for the Second Runner-up. I am thankful to the sponsor of the first prize, Tenzin Charlie of Phurba International, a company based in Taiwan, and to the sponsor of the second prize, Tenpa Dorjee from California. Tenpa Dorjee has started a “give back to the community” project with an organisation called My Village, which employs youths in his own settlement of Bhandara. I also thank many of those who contributed through our crowd-funding page. The preparations are all complete. We look forward to presenting a beautiful and exciting pageant for you. As an experienced judge at many of the cultural show competitions in India and America, I know what it takes to judge a competition and what vital points add up for the final successful result tabulation. Physical statistics are one thing and inner beauty is another where the judges need to stretch their ability to the furthest. Though all the contestants are beautiful and well-prepared, one among them is truly special that needs judge’s attention. She is fashion-savvy, beautifully expressive with a pleasant personality, knowledgeable, and refreshingly bold in attitude, who can face the world for Tibet. This special lady is Tenzin Khechoe. She has all the qualities to top the list. She deserves the crown and I nominate her. Please please Lobsang Wangyal, pick the one who is having good character, talent, kind, honest, and beautiful. Don’t go only with looks and height please. Really appreciate your hard work but we want to see good result so that in future we can try to do something also, if we want to help in needs. Thank you! I’m from Kollegal, but to be honest Tenzin Yangkyi Bylakuppe, Chime Delhi, Khechoe Bangalore, and Migmar New York deserve first, second, third, and photogenic. I heard about Bylcop Tenzin Yangkyi that she is kind, honest, and hard-working. What else do we need to become Miss Tibet now. She is beautiful. I don’t know them but I think Miss Tibet should be the one who has good character, good attitude, kind, honest, and beautiful. Is there a online voting site for Miss Tibet? All contestants are beautiful, but Tenzin Khechoe is the most beautiful and elegant of all. I wish and hope she wins the Miss Tibet title. All the best Khechoe la!